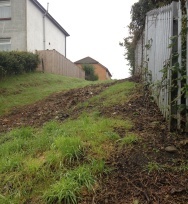 The land next to the railway line and 211 Mynachdy Road has been neglected for many years. The land has finally been cleared by the Council’s housing department and all the vegetation cut back. We recently met with a housing officer to explore the possible options for the area of land. We proposed fencing of the land and a community garden at the front of the area. The officer will report back for fencing and re-turfing the area. We will keep you updated.